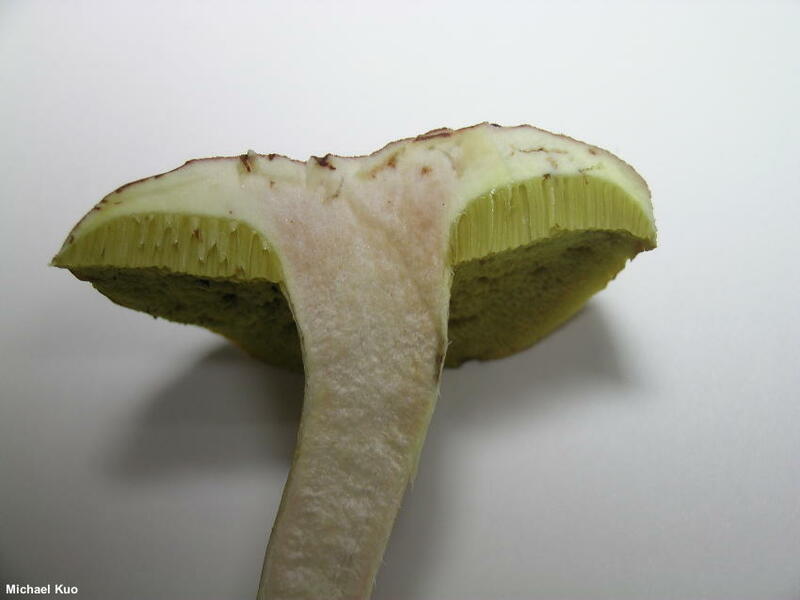 Xerocomus tenax is very similar to Xerocomus illudens; both species are associated with oaks and other hardwoods in eastern North America, both feature a wide-meshed reticulum on the stem, and both turn blue-green when a drop of ammonia is applied to the cap. But Xerocomus tenax was separated by Smith & Thiers (1971) on the basis of its "conspicuously reticulate stipe, the tenacious hold it has on the substratum," and microscopic features, including a pileipellis that does not contain swollen elements. 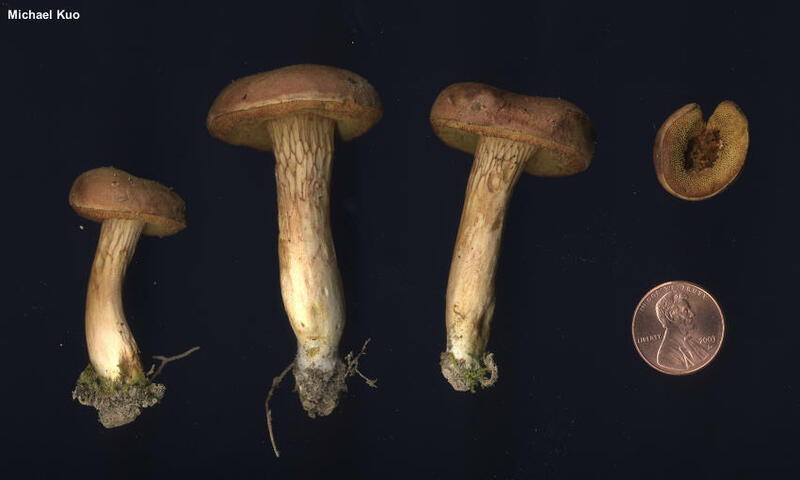 In my collecting experience, additional features separating Xerocomus tenax from Xerocomus illudens include the color of the stem (more yellow in Xerocomus illudens), the color of the cap (more red in Xerocomus illudens), and the dark red reaction of the Xerocomus tenax cap surface to KOH. 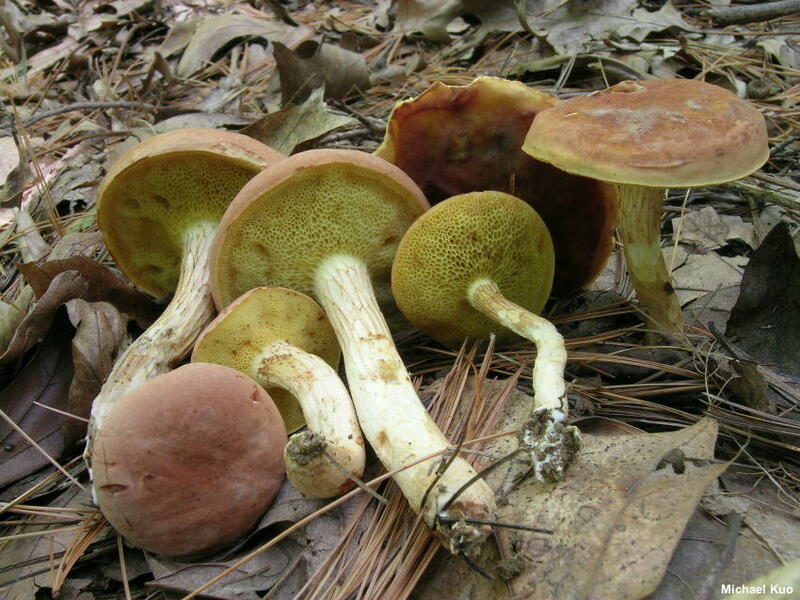 The original author of Boletus illudens, Charles Peck (1898), probably described what are now seen as Xerocomus illudens and Xerocomus tenax together; his account calls for a cap that is "yellowish-brown or grayish-brown, sometimes tinged with red," along with a stem that is "pallid or yellowish," featuring reticulation "either wholly or at the top only." 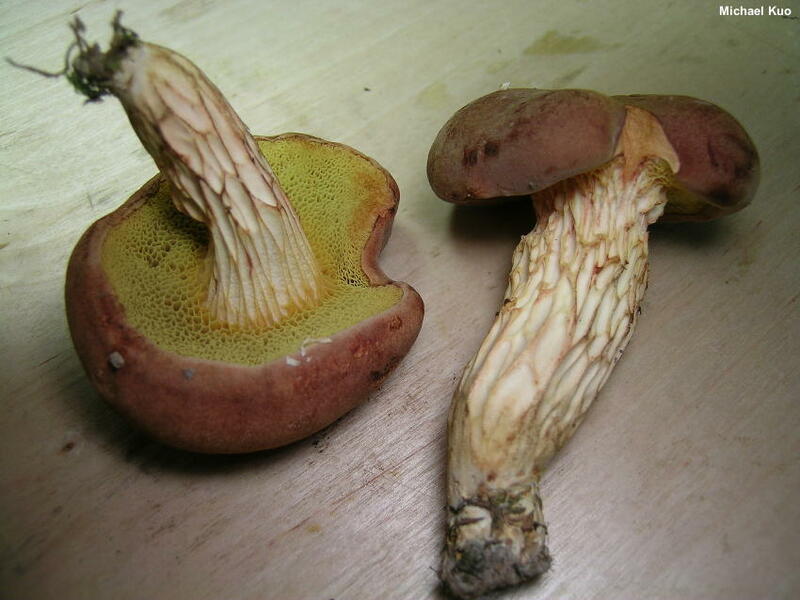 My previous treatments of Boletus illudens, both here at this website and in field guides, have also combined Xerocomus illudens and Xerocomus tenax. Whether or not contemporary, DNA-based study of these species will uphold the concept of Smith & Thiers remains to be seen. Ecology: Mycorrhizal with oaks and other hardwoods; growing alone, scattered, or gregariously; summer and fall; widely distributed in North America east of the Rocky Mountains. The illustrated and described collections are from Illinois. 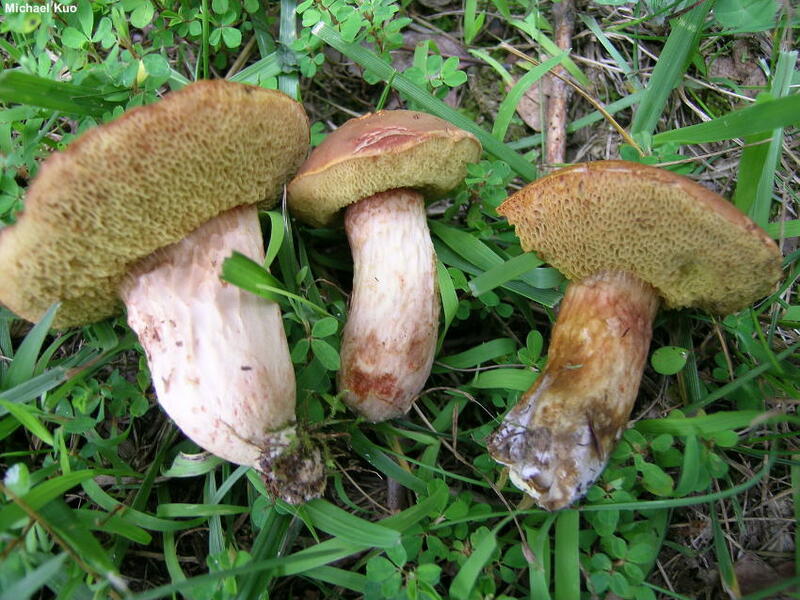 Cap: 3–9 cm; convex, becoming broadly convex; dry; finely velvety when young, becoming bald and sub-leathery; yellowish brown to reddish brown or pinkish brown. 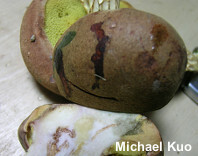 Pore Surface: Yellow, becoming olive yellow or brownish yellow with maturity; not bruising, or bruising slowly brownish to reddish brown; pores xerocomoid, 1–2 mm wide; tubes to 10 mm deep. Stem: 5–9 cm long; 0.5–1.5 cm thick (up to 2.5 cm thick in occasional very thick-stemmed specimens); tapered at the base (often abruptly); dry; solid and tough; widely and coarsely reticulate, with a pinkish to brown reticulum, over the top half or the entire length of the stem; whitish to pale yellowish; basal mycelium white to pale yellowish. Flesh: Whitish to very pale yellowish; not staining when sliced, or turning pinkish in the cap (rarely bluing slightly over the tubes). Chemical Reactions: Ammonia flashing blue-green on cap, then resolving to gray or purplish; flashing green to greenish on flesh, then resolving to gray. KOH dark red to black or dark gray on cap; orangish to brownish or negative on flesh. Iron salts gray or negative on cap; grayish or negative on flesh. 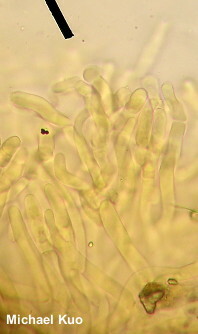 Microscopic Features: Spores 9–14 x 3–4.5 µm; fusiform; smooth; yellowish in KOH. 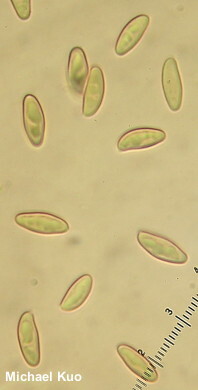 Hymenial cystidia 40–50 x 5–7.5 µm; lageniform; thin-walled; smooth; hyaline in KOH. Pileipellis a collapsing trichoderm; yellow to golden in KOH; elements 5–7.5 µm wide, smooth; terminal cells cylindric with rounded apices, only occasionally short-septate and then not swollen. REFERENCES: (Smith & Thiers, 1971) Nuhn & Halling, 2015. (Smith, Smith & Weber, 1981; Metzler & Metzler, 1992; Both, 1993; Bessette, Roody & Bessette, 2000; Binion et al., 2008.) Herb. Kuo 07319702, 08309702, 08300207, 08220501, 07050703, 07301001, 09091207, 08241404.